Kevin Paul Curtis, the bipolar Elvis/Bon Jovi/Prince/Kid Rock performer accused of mailing ricin-laced letters to Senator Roger Wicker and President Obama, has been released on bond, NBC reports, after a court hearing in his case today was canceled. “I can tell you he is with his family,” said his defense attorney, who suggested Curtis may have been set up after a search of his home turned up exactly zero evidence tying him to the attempted poisonings. 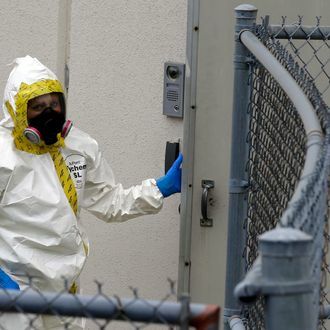 An FBI spokesperson confirmed to the AP, “This remains an ongoing investigation.” A news conference featuring federal authorities and Curtis’s defense is scheduled for 6 p.m., but things are already starting to look too much like anthrax. Update: J. Everett Dutschke, a colorful former Republican candidate for the Mississippi House of Representatives, who was accused in February of child molestation and is himself out on bond, is being questioned in the case. “On Monday, Curtis’ lawyer, Christi McCoy, said she believed Dutschke could have been responsible for mailing the letters noting he had argued with Curtis over email,” Talking Points Memo reports.